On October 15, Governor Tokihiro Nakamura of Ehime Prefecture visited the Ministry of Economy, Trade and Industry (METI) in Tokyo, where he conferred with Minister Motoo Hayashi. At the meeting, he received confirmation that the Japanese government remained committed to responding to the prefecture’s eight-item request concerning safety measures for the Ikata Nuclear Power Plants, owned and operated by the Shikoku Electric Power Co. In their talks, Hayashi, who just became METI minister on October 7, told the governor that the ministry would continue to deal with safety measures “in the same way as the previous minister Miyazawa had,” thus committing himself to visiting the Ikata-3 NPP (PWR, 890MWe) soon. The visit was one of the eight items in the prefecture’s request. On July 15, Shikoku Electric Power had been given approval to change the reactor installation at Ikata-3 to make it compatible with the new regulatory standards issued by the Nuclear Regulation Authority (NRA). In light of the lessons learned from the accident at the Fukushima Daiichi NPPs and the special geographical and social conditions of the Ikata NPPs, Governor Nakamura explained to Minister Hayashi the status of the on-site confirmation of additional measures at Ikata-3 for earthquakes, power-source measures and reporting systems, all of which were requests made by the prefecture to the power company independently. The governor will make his final decision concerning the restart of Ikata-3 shortly, following his visit to the site on October 2 and the approval by the prefectural assembly one week later on October 9. He will do so once he confirms how the national government will act, as well how Shikoku Electric Power feels and what efforts it has taken. Another precondition is gaining the understanding of the local community concerning safety and necessity. Talking to the press after his meeting with the minister, the governor said that “the citizens of the prefecture have a range of opinions, with some agreeing with the conditions and others not.” He stressed the importance of making the final decision process sufficiently explainable to the public, and gaining their understanding. 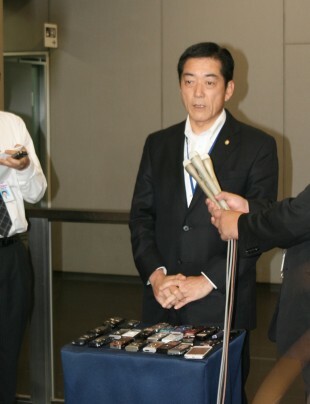 Meanwhile, he said that the question of research on decommissioning technology—another of the eight items request in the prefecture’s request—needed continued discussion, assuming that Shikoku Electric Power would first indicate its intentions on whether or not to retire the Ikata-1 reactor in 2017, which will be the 40th year since its start of operation.